Foursquare’s Jeff Glueck, D from xAD and Yext CEO Howard Lerman debated where location-based marketing has come from and where it’s going over the next few years. Unquestionably voice search will change results in the coming years. The answer box and knowledge graph were the first indications that Google wants to show a single, accurate answer where it can and voice is a big reason for this. We can infer an intent to purchase from search query data but it’s hard to beat literally knowing when a customer just walked into a store. Facebook is an interesting anomaly in that unlike its rivals in Google, Amazon and Microsoft it isn’t actively doing anything with voice search. Microsoft is probably leading the field in voice search right now, but it is very much one for the future. As D pointed out, Facebook has (undeservedly in my opinion) retained its reputation for helping advertisers shift products for less than Google, but the margins are about to shrink. Even now, location modifiers are having a huge impact on the ROI of ads. Some interesting stats from Dave too: Google also owns YouTube, which is the second biggest search engine in the world. 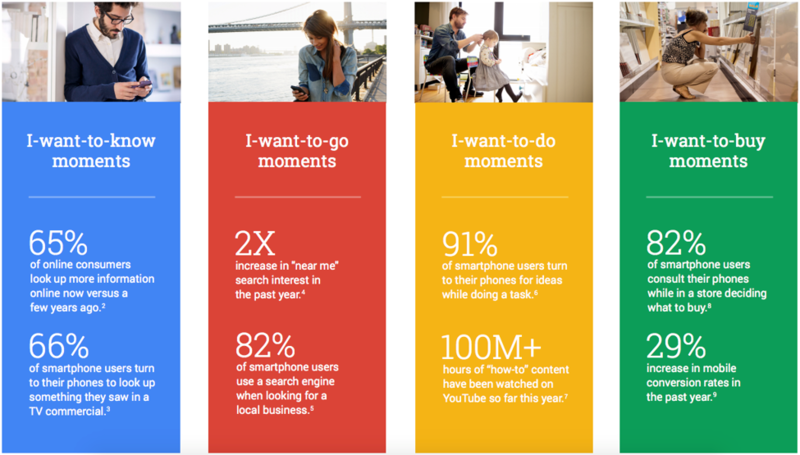 Now 1 in 10 YouTube searches display local intent: this has tripled in the last year. The majority of people using Google Keyboard are using it with local intent too. Dave talked through Google’s idea of micro-moments and made it clear that Google doesn’t think advertisers can interrupt every moment of the day: there are four key moments that we all experience frequently that constitute an opportunity for advertisers. The biggest takeaway from Dave’s talk was that just appearing shouldn’t be enough for businesses: they have to like what they see (and what they show to their customers). It’s clear that reviews will be the story of 2017 in search. Does voice search change everything? 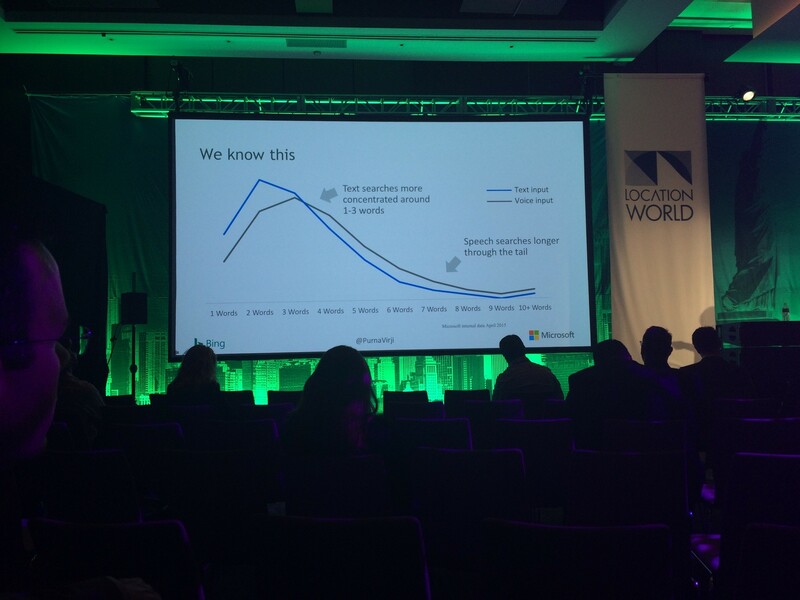 Bing‘s Purna Virji had some very interesting things to say about voice search, not least of which was that Cortana, Bing’s IPA, has 100m active monthly users (about a third as many as Twitter). Ad extensions have a huge impact on where people look and click – we recently looked at mobile CTR on Google and ads in some verticals are so huge that click through rate for ads showing in position one can be 10% higher. Ad extensions on both Google and Bing contribute to this. …referencing self-driving cars, which will be considered too dangerous – and cars, unlike guns, aren’t in the constitution so have a realistic chance of getting banned. Pokémon GO showed AR has real world applications but we’re some way off brands being able to crack this. …which I 100% agree with and 100% expect to change within the next 6 months. We’re now seeing paid listings in Maps but we’ll soon see many more, and Waze and Uber are doing some very interesting things tying maps with the real world. 95% make purchases in-store based on ads seen on a mobile device – putting my SEO hat on I’m expecting a lot of correlation, not just causation here…if your targeting is that good you’ll advertise to your perfect customer, who might just buy from you anyway. Geer is doing some ambitious things (functionality allowing mobile users to save ads so they don’t lose the information) but the message is spot on: the problem with advertising is crap ads and people will engage if the creative is right for them. 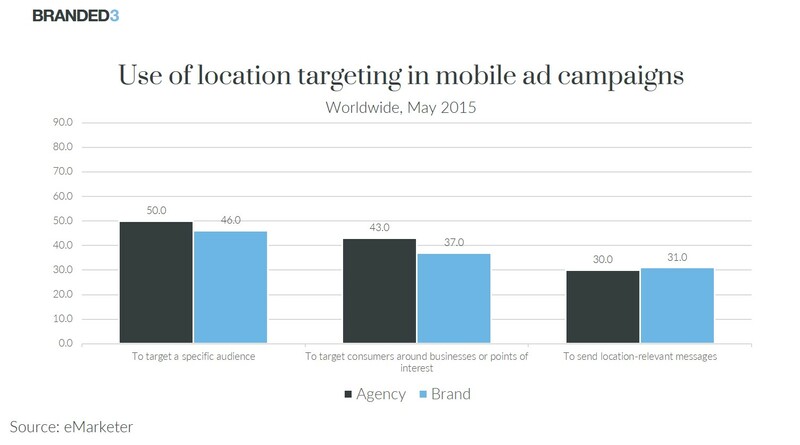 Factual‘s Vikas Gupta referenced a 2015 poll by xAD stating that 8 in 10 mobile advertisers use location targeting. According to Gupta, 6 in 10 ad dollars are projected to be spent on location targeted ads, with a 38% increase in mobile ad spend YOY. Location-based audience targeting is currently the second most popular form of audience targeting, but since 82% of marketers say they are expecting to use more of it next year (and 69% are using it more this year) Gupta thinks it’s likely that location will be the primary form of audience targeting on mobile in future. eMarketer suggests mobile location-targeted ad spending will rise 56% this year in the US alone (with a 37% growth in ad spend for national i.e. non location-targeted campaigns) so I think Gupta is probably being conservative when he says it’s “likely”. Following Gupta was Rob Minaglia from Pitney Bowes, whose key takeaway was that radius-based geofencing for mobile ad targeting doesn’t work. Minaglia’s example was that a radius of more than 200m from Location World venue The Conrad would place you in the Hudson River, even though targeting Manhattan makes sense. Boundary-based geofencing makes more sense and Pitney Bowes are doing interesting things building a location stack that factors in drive time, points of interest etc. Paul Bongers from our friends at Searchmetrics demonstrated that different US states search for very different things even closely related to the same product: expecting to see different ingredients in recipes for the same meals, for example. Businesses with a physical presence should look at how search volumes differ between the cities in which they operate: a car dealership with 3 locations shouldn’t be misled by national search volumes. Andrew Shotland delivered a data-heavy presentation based on Local SEO Guide’s Local SEO Ranking Factors study. The full document is definitely worth a read, but to summarise: local SEO in 2016 is like SEO was in 2006. Anchor text and backlinks are everything; achieving strong local-pack rankings and avoiding “Penguin” and/or manual actions being applied to your site in the organic index is a minefield. Despite this, just claiming Google My Business listings is not enough to rank in competitive local-packs. Shotland’s best tip is to include a local-angle in PR/link acquisition campaigns. Links will continue to be the biggest local SEO ranking factor until Google inevitably monetises the entire local-pack. Reviews. Reviews are minutes away from being a ranking factor, but if Google lets searchers filter out businesses with bad reviews (which most reviews are if businesses leave users to it) then reviews will be a requisite to ranking. A bad reputation is basically an algorithmic filter.